On the eve of Independence Day, the Alamo is surprisingly uncrowded. A few clusters of tourists stroll through the lush gardens at the back of the site, where Pam and Dan Gattermeyer of Cincinnati stop to rest in the shade. “I wasn’t too disappointed,” Pam says, explaining that her mother had warned her the experience would be a letdown. Before visiting the Alamo today the Gattermeyers had stopped at the nearby Rivercenter mall and watched an Imax movie depicting the 1836 battle that made the mission famous. The movie and a Segway tour they took the day before helped them understand what they were seeing. The task of “fixing” the Alamo and its plaza—periodically suggested and abandoned over the past 30 years—is a challenging one, made more complex by the passions the site inspires. When they leave the garden, the Gattermeyers will cross Alamo Plaza on their way to the River Walk. At the edge of the plaza they’ll pass Ripley’s Haunted Adventure, where costumed actors spattered with fake blood cackle at pedestrians. They’ll hear blaring music piped from the storefronts and pass shops selling T-shirts reading “I don’t get drunk, I get awesome.” Their parting attempt to photograph the iconic Alamo church may be blocked by a sno-cone stand or a tour bus speeding by. Despite the Alamo’s central role in Texas history and legend, San Antonio and state officials are underwhelmed with the experience it offers its roughly 2 million annual visitors. Guests are surprised at its small size and close proximity to the commercialism and grit of the country’s seventh-largest city. The iconic building today known as “The Alamo” is the church of Mission San Antonio de Valero, and one of only two structures that remain from the much larger original compound. That enclosure encompassed the city plaza in front of the church and the long barracks building, as well as land now occupied by the federal building to the north and unaffiliated tourist attractions to the west. In the 18th century, the ground beneath the plaza served as the mission’s cemetery. More than 900 people, mostly Native Americans, are buried there. In the 1836 battle, the plaza was where many of the 189 known defenders of the Alamo, and a portion of the much larger attacking Mexican forces, died. But it’s easy to miss all this. The plaza lacks coherent interpretive signage, relying on a disjointed collection of plaques to explain the site’s significance. As city property, it’s used for public gatherings that critics say are inappropriate for a battlefield, never mind a gravesite. At its edge, Ripley’s and the like provide a spectacle incongruous with reverence. But the task of “fixing” the Alamo and its plaza—periodically suggested and abandoned over the past 30 years—is a challenging one, made more complex by the passions the site inspires. The state, the federal government, the city of San Antonio and private citizens each own part of the compound’s original footprint. Historians, elected officials, business owners and descendants of the tribes that lived at the mission all feel a sometimes proprietary connection to the site. By this fall, a new municipal committee will issue its vision and guiding principles for a master plan for the plaza, and in October the General Land Office will host a gala to seed its new Alamo Endowment. They’re the latest in a long history of attempts to usher in a new era for the state’s No. 1 attraction. Ten years ago, Tomerlin joined the Daughters of the Republic of Texas (DRT), the heritage organization that began managing the Alamo in 1905. When she joined, Alamo work was strictly a volunteer proposition, but in 2011 the Legislature transferred the site to the state, which then contracted daily operations to the DRT. The DRT made managing the Alamo a staff position, which Tomerlin has held ever since. The city convened groups to study the plaza in 1988 and 1994. In 2011 it hired the New York-based Project for Public Spaces to recommend ways to increase the plaza’s appeal to locals. Other than closing Alamo Plaza East to vehicle traffic, few of the reports’ major recommendations have been implemented. San Antonio City Councilman Diego Bernal is undeterred by the shelf of studies. The 37-year-old is in his second term representing District 1, an ethnically diverse area in the heart of downtown that’s home to the River Walk, the Pearl Brewery redevelopment and the Alamo. When disappointed tourists vent about their Alamo visit, his office receives their calls. He’s also part of San Antonio’s effort to nudge its downtown into world-class status for both tourists and residents via investment in downtown parks, filling vacant buildings, and offering incentives for condo and apartment construction. An Alamo makeover is a natural next step. The committee officially formed on March 6, the anniversary of the 1836 battle of the Alamo, and began meeting in May. By this fall, the group—which has 21 members, including appointees named by each City Council member, as well as representatives of the tourism industry, historical preservation, and archaeological interests—will draw on the work of the 1994 committee to develop guiding principles for the site. The city’s goal is to hire a master planner by January, retaining the committee as an advisory group, and adopt a plan by September 2015. In Ramon Vasquez’s opinion, this would result in more local interest in the Alamo. Vasquez, who is on the committee, is executive director of the American Indians in Texas at the Spanish Colonial Missions and a member of the Tap Pilam Coahuiltecan Nation. He suggests that by telling the story of the mission, as well as that of the Tejanos living outside its walls, the site could be made more meaningful to local families. At a summer meeting, the committee debated how to tell the story of the Alamo in an inclusive way while recognizing that most visitors are drawn by the 1836 battle narrative. That story—the essence of which is fighting for one’s beliefs against all odds—is a universal one with a “mythical resonance,” Gary Foreman says. A historian and documentarian with a lifelong interest in the Alamo, Foreman espouses an idea called the Alamo Plaza Project. Neither Foreman, who is based in Indiana, nor other leaders of the project is on the city’s advisory committee, but he says they’ve received hundreds of supportive letters and comments over the years. Foreman started advocating for Alamo improvements in 1982, after a near miss with a taxicab on Alamo Plaza East, the street that runs immediately in front of the church. Struck by the idea that he wasn’t safe as a pedestrian, even so close to an important site, he started building support for a different vision. The street has since been closed, but Foreman has a grander proposal to rebuild the compound to its 1836 appearance and direct visitors through a reconstruction of the original entry gate on the site’s south side. To rebuild the mission’s west wall, the row of 1880s-era buildings whose first floors house attractions like Ripley’s Haunted Adventure would be removed. The Foreman plan’s piece de resistance would be the transformation of the federal building at the site’s north end—a six-story building that includes a post office and a courthouse and that recently underwent a $56 million renovation—into a multimedia center and museum. Foreman’s proposal, which is not based on actual negotiations with property owners, prioritizes reconstruction of the compound. But that idea is viewed with skepticism by preservationists. The problem with any plan to restore the Alamo or its plaza is establishing the “period of significance” on which restoration efforts would be based, Pemberton says. Would that be the pre-mission era, when native peoples lived there? The mission era? The 13 days of the siege and the battle? The 1850s army era? The establishment of commerce? There’s also the issue of property rights. Phillips, 44, who exudes the clean-cut earnestness of a Little League coach, is CEO of Phillips Entertainment Inc., which operates five attractions on the plaza, including Ripley’s Haunted Adventure and Tomb Rider 3D. Appointed to the Alamo Plaza Advisory Committee by Mayor Julian Castro to represent the tourism industry, Phillips splits his time between his family’s businesses and industry work, like chairing the San Antonio Convention and Visitors Commission. Like Vasquez, he speaks for himself rather than for the committee. He runs through the numbers: 28 businesses have failed along Alamo Plaza in the past 25 years. The combined rent for three businesses he owns on the plaza is $58,000 month. He says his attractions and the other businesses that front Alamo Plaza collectively employ 244 people, pay $2 million in city, county and state taxes, and generate an annual economic impact of $19 million. Phillips maintains a list of improvements he’d like to see to the plaza: Close Alamo Street. Level the irregular curbs. Add green space, shade and seating. Bury the electric lines. 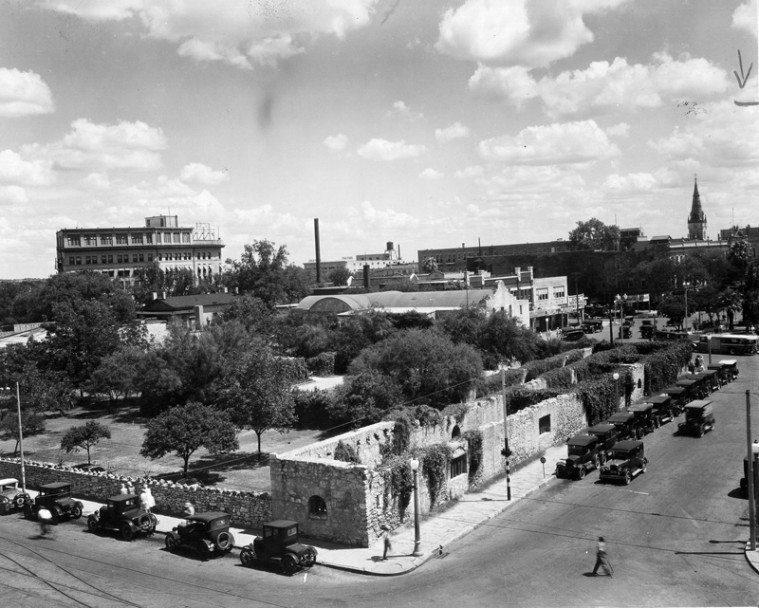 In truth, Kenneth Foote says, the Alamo is not unique in its proximity to commercial interests. Foote, a professor of geography at the University of Connecticut, visited the Alamo multiple times to research his 1997 book, Shadowed Ground: America’s Landscapes of Violence and Tragedy, which includes analysis of how battlefields are preserved. In Virginia today, he says, suburban developments are creeping close to sprawling Civil War battlefields. Even at Gettysburg, held up by some advocates as the standard to which the Alamo should aspire, a privately owned 307-foot-tall observation tower loomed next to the battlefield for almost 30 years. Built in 1974, the tower was derided by preservationists for detracting from the site’s atmosphere; its owners said it was the best way for visitors to see the landscape and understand the military strategies employed there. The National Park Service obtained the property via eminent domain and demolished the tower in 2000 as part of an effort to restore the battlefield to its 1863 appearance. As with many sites now recognized as historic, efforts to preserve the Alamo didn’t begin until decades after the battle for which it’s remembered. After the 1836 battle, the church was used intermittently as a fort by Texan troops. In the late 1840s and 1850s, after Texas joined the Union, the U.S. Army employed it as a storage warehouse and added the roof and arched parapet. In the 1870s and 1880s, the Catholic Church sold part of the compound to entities that built general stores next to the chapel. In 1905 the Legislature gave the Daughters of the Republic of Texas custody of the site. Texas Land Commissioner Jerry Patterson is clear about his ambitions for the site: Add parking, close Alamo Street in front of the plaza, restore it to look like it did in 1836, and build a visitor center. The latter goal is made more urgent by the late-June announcement that singer Phil Collins has donated his extensive collection of Alamo artifacts to the state. Through interviews and workshops with locals and time-lapse video of the plaza, the study concluded that most people stop for a photo in front of the church, and that’s often the extent of their visit. The report recommended closing the street to cars, improving the signage and adding mobile vendors, food, and more places to linger. For one day in August 2012 the city implemented some of these ideas with the help of Team Better Block, a Dallas-based business that helps cities test-drive changes to public space. “Cities spend millions on planning, and then these plans sit on shelves,” says cofounder Jason Roberts. “What we do is implement ideas temporarily to test them out, put them on the ground and see what actually works.” Partnering with locals, Team Better Block built a scale replica of the original compound’s entry gate and conveyed the site’s history via smartphone-scannable QR codes linked to explanatory websites. The team filled the plaza with movable chairs and got permits from the city to temporarily close Alamo Street, where a long table was installed for an upscale dinner-and-wine event.